Recently on the Natural Health Show under the heading “Radical Remedies” I talked about the medical benefits of Nicotine. A lot of you might have found this topic rather controversial. I decided to expand on this topic here so that you may get a better feel of what it all means. I will again summarize the beneficial effects of Nicotine but I want to also emphasize, as in the radio talk, that nicotine itself (in gums, dermal patches, lozenges, electronic cigarettes, or nasal sprays) cannot be compared to smoking. Smoke from tobacco contains tar which is toxic to our body and it also contains well over two thousand carcinogens (i.e. substances that can cause cancer). These harmful substances are also present in other forms of commercial tobacco such as chewing tobacco, and snuff. On the other hand Nicotine which is only one of the components of tobacco smoke is not a carcinogen in itself and thus it does not cause cancer. But before we go any further let’s go back to the basics. Nicotine is substance found in the nightshade family of plants. It is a nicotinic acetylcholine receptor antagonist, meaning that it binds to and stimulates the acetylcholine receptors throughout our body. Acetylcholine is a neurotransmitter; a neurotransmitter is a substance released by one nerve cell to act on the adjacent nerve cell or cells as a communicating substance. It has a unique and a paradoxical effect in that at low doses it acts as a stimulant on the brain function and at higher doses it acts in an inhibitory fashion as a brain function depressant. Its stimulatory effect is due to the release of glucose (i.e. sugar) from the liver, adrenaline from the adrenal glands, as well as adrenaline and dopamine acting as neurotransmitters in the brain. It also reduces appetite and increases metabolism thus causing some smokers to lose weight. At higher doses it enhances the activity of serotonin and natural opioids (substances occurring naturally in the brain as neurotransmitters and are similar in structure to morphine) causing a calming and pain killing effect. It is very unique in this respect as it changes from a stimulatory substance to an inhibitory substance as the dose increases. As far as its medicinal uses there are numerous very well designed studies that show Nicotine’s positive medicinal attributes. For example smoking (due to the effect of Nicotine) reduces the risk of developing Ulcerative Colitis, a chronic and debilitating disease of the large intestine. It also appears to interfere with the development of Kaposi’s sarcoma (a certain type of cancer) in HIV patients and reduces the chance of preeclampsia in pregnancy a condition marked by high blood pressure, headaches, as well as a medical threat to the mother and the fetus. In addition it reduces the chance of developing allergic asthma, although one has to remember that smoking itself increases the severity of asthma due to irritants contained in smoke. 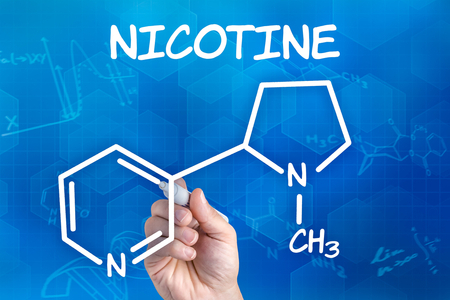 Nicotine has also been shown to be capable of inhibiting Monoamine Oxidase an enzyme responsible for the breakdown of Dopamine. During this process toxic by products are formed that are toxic to brain cells and which may have a direct contributing effect on the development of Alzheimer’s and Parkinson’s disease. Other conditions where research has shown Nicotine’s positive effects are nocturnal frontal lobe epilepsy, depression, attention deficit hyperactivity disorder, and obsessive compulsive disorder. Finally because of its effect on increasing the levels of acetylcholine in the brain Nicotine has a positive effect on memory. All right, but all this good stuff aside let’s remember that there is always two sides of the story especially when it comes to pharmaceuticals and Nicotine certainly falls within this category. Nicotine is a very addictive substance due to its effect of increasing Dopamine in the brain (the substance responsible for making us feel good) and also due to its stimulating effect on the parts of the brain called the “reward centers”. Thus Nicotine acts as a substance with strong addictive qualities. Furthermore Nicotine increases blood pressure (something that has to be considered especially in hypertensive patients), it causes the constriction of airways (something that has to be considered in asthmatics and people with certain lung conditions), it increases heart rate and constricts heart arteries to a certain extent (something that has to be considered in people with heart conditions), and causes increased levels of insulin and may contribute to insulin resistance a fact that has to be taken into account by obese individuals and individuals with diabetes. Thus my conclusion is this. As with any pharmaceutical you always have to weigh the pros and cons. But if you are an individual with any of the conditions listed above where Nicotine has shown a positive effect then the pros far outweigh the cons particularly if you don’t have any of the conditions listed where Nicotine may have a negative contribution. But even in those cases one should ask: Should I try Nicotine to decrease the severity of a seriously debilitating condition such as Ulcerative Colitis and thus bring me substantial relief while at the same time increase my blood pressure slightly where previously my blood pressure normal? As a doctor I would answer to myself yes I want to try this substance to bring me relief, even so much so when considering the fact that the negative effect of increasing blood pressure would usually take decades to have any detrimental effect. This weighing of pros and cons should always be considered when taking any pharmaceutical for any medical condition as all of them have positive and negative effects. It is when the positive effects far outweigh the negative effects that the answer to taking them or not should be obvious. Categories: Digestive Health, Lifestyle, Radical Remedies, by Dr. Karol, Stress Relief | Tags: nicotine | Permalink.